Not all cats are the same when it comes to riding a car. Some are scared or violent, some get sick, but some are as chill as can be. We used to take hour-long rides with our cat Jersey and had no problems. But then something changed. We took her to a clinic for spaying surgery and this is where we lost her trust. She became hellishly afraid of car rides, or even just seeing her cat carrier. She would run away and try to scratch anyone who tried getting her near the car. She vocalized in unearthly tones and released her gastro-intestinal contents through various orifices—the usual stuff of a short car ride. The above is an extreme example; your ride with your cat is likely to be easier than that. But if not, here are few tips to help you. Always use a cat carrier. It isn’t just a convenient way to carry a cat. It’s a safety measure, equal to seat belts for us, and required by law in many locations. In case of accident or sudden braking, a carrier keeps your pet secure. It also keeps the cat from wandering around the cabin, perhaps distracting the driver and causing an accident in the first place. Always put your cat inside a carrier during a car ride, regardless of the distance traveled. And fasten the carrier with a seat belt or secure it some other way. Choose a good cat carrier. First of all, it must be comfortable—for you to carry around, and for the cat to sit inside. So because your cat wants it larger and you want it smaller, you’ll have to compromise on size. The final decision depends on how long you have to carry it and how long your cat must sit inside it. For long or frequent car rides, consider getting a crate. 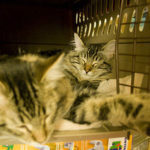 The largest crates can house a cat bed, food, and a litter box. A litter box may seem weird, but there are cats who do use them in a moving car. 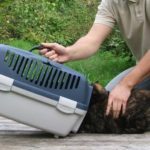 Get your cat used to the carrier. Keep the carrier visible at all times. Put your cat in there without actually going to horrible places and give him treats after the release. 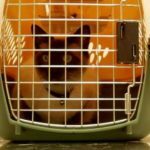 It changes the way your cat sees his carrier—from an instrument of torture to a plain piece of furniture. 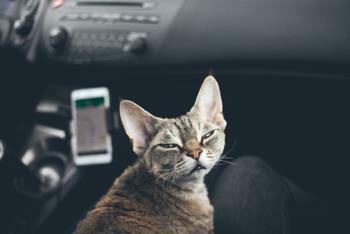 Calm your cat during the ride. How do you do that? First, don’t overdo it. Place your cat where he or she will feel less uncomfortable, which is quite personal for each cat. Some like to see where they’re going and have the owner in sight, some want to be left alone. You can place the carrier with the opening facing you or you can put it away and even cover it with a towel. If it helps, you can talk to your cat in your normal “I’m talking to my cat” voice. You can also give him tasty treats so the trip is associated with something positive, or at least his mind is distracted by eating. Playing the radio can help calm the cat down, provided he likes your music better than the sound of the engine. IMPORTANT: Don’t interact with your cat if you are driving. Your undivided attention must be on the road. Under no circumstances should you let your cat out of the carrier while the car is moving. If your cat needs to be let out, pull over and park first. Don’t just go to the vet. 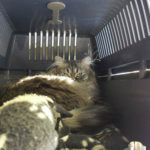 If you only drive your cat to the veterinarian, he will know what’s going to happen the next time you bring out the carrier. Instead, take your cat to nice places, too. For a cat, a nice place is a neutral place. Take him to your vacation house, or a rural area, or just drive around the block. Of course this may sound silly; after all, cats aren’t dogs who need to be with you wherever you go. But if taking him with you helps to relieve his fear of car rides, go for it. Think what cat supplies you will need. What you need depends on the ride length and its purpose. Things you should consider are food, water, bowls, litter box and litter, leash and harness and your cat’s medicine if he’s taking any. Plan enough breaks during a long car ride. Long car rides are tiresome for cats as well as people. They need to stretch, go to the toilet, get water or food, or just see something else besides the carrier’s walls. There are no fixed rules on how long breaks should be or how often you need them. A typical cat goes to the toilet every four to six hours. Some cats can hold it longer, some can’t last half that long. The general rule is, if you need a break, your cat probably needs one too. Put identification on your cat. Anything can happen on the road. Cats can not only run away during a stop, they can also get lost after a crash or theft. An ID tag with your cellphone number is the quickest way you can reunite with your cat if someone finds him. Even better, having a microchip ensures that if his collar is lost, your cat can be returned if he ends up in a shelter or medical clinic. You should also put a photo of your cat in your glove compartment, just in case. 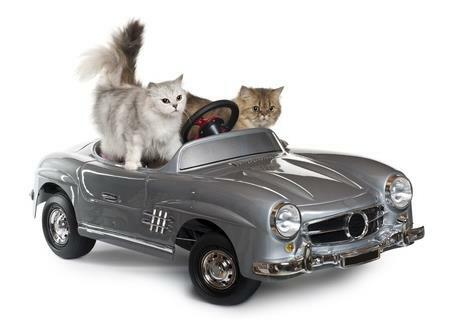 Just remember, even though many cats adapt to driving, few are suitable for life on the road. And, unlike dogs who love their owners wherever they are, cats prefer to be stay-at-home pets. Thus, if you are going on a vacation, it might be better for your cat to remain at home and to have someone check on him daily.